The CDM Cannot Deliver the Money to Africa. 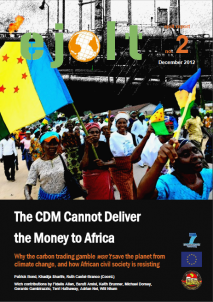 Ejolt report 2: The CDM Cannot Deliver the Money to Africa. Why the carbon trading gamble won’t save the planet from climate change, and how African civil society is resisting. Many sites of emissions in Africa – e.g., methane from rotting rubbish in landfills, flaring of gas from oil extraction, coal-burning electricity generation, coal-to-liquid and gas-to-liquid petroleum refining, deforestation, decomposed vegetation in tropical dams – require urgent attention, as do the proliferation of ‘false solutions’ to the climate crisis such as mega-hydro power, tree plantations and biofuels. Across Africa, the CDM subsidises all these dangerous for-profit activities, making them yet more advantageous to multinational corporations which are mostly based in Europe, the US or South Africa. In turn, these same corporations – and others just as ecologically irresponsible – can continue to pollute beyond the bounds set by politicians especially in Europe, because the Emissions Trading Scheme (ETS) forgives increasing pollution in the North if it is offset by dubious projects in the South. But because communities, workers and local environments have been harmed in the process, various kinds of social resistances have emerged, and in some cases met with repression or cooptation through ‘divide-and-rule’ strategies. The first chapters in this report set the context for the carbon markets and the CDM mechanism, revealing its gloomy future prospects, and map the players in CDM markets and voluntary schemes. The next chapters dissect six case studies from eight African countries: the DRC, Ehiopia, Kenya; Mozambique, Nigeria, Tanzania, Uganda and South Africa. They consider the fraud of a landfill methaneelectricity project; CDM corruption of local governance from gas-flaring-related subsidies; the emergence of trees, plantations and forests within CDM financing debates; failed CDM proposals involving the exploitation of gas reserves; megadams searching the CDM status; and the rise of Jatropha biofuel industries. All these cases suggest the need for an urgent policy review of the entire CDM mechanism’s operation, with the logical conclusion that the system should be decommissioned and at minimum, a moratorium be placed on further crediting until the profound structural and implementation flaws are confronted. The damage done by CDMs to date should be included in calculations of the ‘climate debt’ that the North owes the South, with the aim of having victims of CDMs compensated appropriately. Congratulations. It seems good observation generally. However, regarding the piece on Ethiopia, I believe some body from Ethiopia and working with local people should have been contacted. I will come back with some comments after going through the document. Pingback: EARTH PEOPLES Blog » Blog Archive » Zivilgesellschaftliche Organisationen fordern, dass die EU ihren Emissionshandel abschafft.